From routine cleanings and fillings to bruxism devices, Oasis Dental is equipped to handle all your dental needs including same day crowns. To help you understand your options, we've included descriptions of some of our leading services on this page. Oasis Dental is proud to introduce "SAME DAY CROWNS..."
We use CAD/CAM (Computer Aided Design/Computer Aided Manufacturing) technology that houses a camera, computer and milling machine in one instrument. Digital imaging captures a picture of the damaged tooth and eliminates the need for uncomfortable alginate impressions. 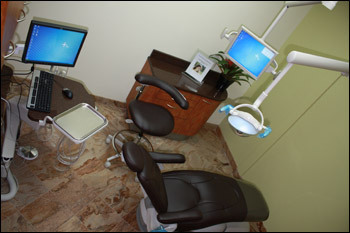 The optical “impression” is transferred and displayed on a color computer screen, where the dentist uses 3D technology to design your new crown. Then, CAM takes over and creates the crown while you wait. The dentist bonds the crown to the surface of the old tooth, and you’re ready to go.